Beautiful certificate from the Transcontinental Airport of Toledo, Inc issued in 1928. This historic document has an ornate border around it with a vignette of an old monoplane. This item has the signatures of the Company's President and Secretary and is over 80 years old. The Toledo Transcontinental Airport was opened in 1928. The site was selected because it was on a route of beacons followed by New York-to-Chicago mail planes. 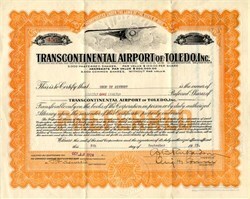 In 1936, the city of Toledo acquired the rights and interest of Transcontinental Airport of Toledo, Inc.